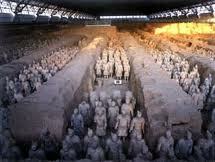 China Study Trip is finished and Master Liming is back to the Centre now! 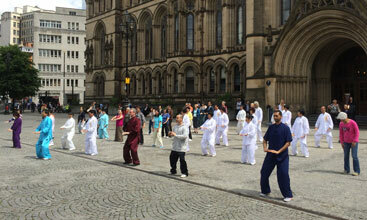 A Great Tai Chi Open Event in Albert Square at Manchester Town Hall! Details: The Tai Chi Open Event on 11th June 2014 at Albert Square in front of Manchester city Town Hall for both beginners and experienced students was successfully finished. A group of 36 Tai Chi practitioners from Guangzhou city, China took part in the event and did a great demonstraion on the day. Sifu Aamir Rafi, Pete Hornby, Diqiang and Xianglin Li along with a group students from Chinese Health Information Centre were also taking part in the event. China Trip August 2014 is starting to take booking now! Grandmaster Liming Yue is going to take a group of students to visit China in August 2014. The sightseeing places cover Great Wall, Summer Palace, Heaven Temple, Forbiden City in Beijing, Tai Chi village, Shaolin Temple, Wudang Mountain Taoist Temple, Xian city, Shanghai, and Zhangjiajie Forest Park... The training will cover Tai Chi, Qigong and Shen Gong with Grandmaster Liming Yue and many additional studies with Taoist monk on Wudang mountain, Shen Gong with Grandmaster Li Zhiyi, Tai Chi training with Grandmaster Chen Zhenglei and Chen Yu are also available upon request. It will be another brilliant China Trip again; People will be from all over the world for the China Trip in 2014. Indoor Student Acceptance Ceremony will take place on 1st February 2014! Details: Grandmaster Liming Yue will take his First indoor student accepting ceremony during the Chinese New Year period on 1st February 2014 which is the same day as Tai Chi Centre Official Opening day. According to Chinese traditional culture the future indoor student have to send their request in writing to be accepted as an indoor student. Only approved students can be accepted as indoor student and you will be invited as GM Liming Yue's indoor student group on the Facebook and your name will also be listed on the indoor student web page. Official certificate will be issued on the ceremony. The traditional procedure is the indoor student present a cup of tea to the Master then take an acceptance photos. We have received 42 applications by the deadline on 18th January 2014 and we are starting to organize everything and prepare the certificate and Indoor Student book at the moment. Any further request of indoor students will be arranged to the 2nd Ceremony in the future. Tai Chi Centre Official Opening is coming on 1st February 2014! The Centre will be officially opened at 11:00am, on Saturday, 1st February 2014. All students and their friends are very welcome to visit the Centre and celebrate the opening with us together. 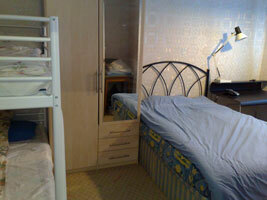 Chinese & English tea, soft drinks, crisp and sandwich will be provided for visitors in the Centre. There will be a Tai Chi chating and informal demonstration during the opening hour as well. It is all FREE to our visitors on the day. Master Nick Taylor, Sifu Aamir Rafi, Sifu Diqiang, Sifu Anthony Rushton, Glenn Pary, Bill Wilkinson, Scott Broadavnst, Andy Plant, Mike, Paul Lightfood, Valia, Paul Bellamy, Natalie Faria - Vare, Cemel, Mariano, Macello, Afsaneh Rasti, Jon Cowley, Darren Chan, Chief Chef Mr. Huang and Professor Xianglin Li who had helped during the decorating are invited as guests to our official opening ceremony and also free of charge for the seminar after the opening from 1pm to 5pm in the Centre. 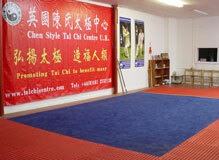 Tai Chi Centre in Chinatown will be offially fully open on Saturday, 1st February 2014! 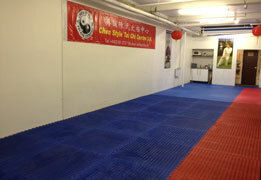 Tai Chi Centre in Chinatown is partially open for classes now. All existing students and new students are very welcome to train with us in the new Centre! Other facilities are to be finished by end of January 2014. The capacity of the New Centre is smaller than our old Centre. Spear, pole and sward form can be practiced in the New Centre. It is warmer than the old Centre and easy access from airport, train station and coach station, plus plenty of restaurants and bars in town. It is a great location for distance students travelling by public transportation. There are also a lot of cheap car park around the area and we will publish a list of available car park shortly. A great thanks to Master Nick Taylor (worked very hard day and night for 9 days, One Year Free Diamond membership is awarded), Sifu Aamir Rafi, Sifu Diqiang, Sifu Anthony Rushton, Glenn Pary, Bill Wilkinson, Scott Broadavnst, Andy Plant, Mike, Paul Lightfood, Valia, Paul Bellamy, Natalie Faria - Vare, Cemel, Mariano, Macello, Afsaneh Rasti, Jon Cowley, Darren Chan, Chief Chef Mr. Huang and Professor Xianglin Li who had helped during the decorating. All people who has offered help during the decorating will be invited as a guest to our official opening ceremony on Saturday, 1st February 2014 plus free seminar vouchers, which can be used for future seminars running by the Centre in 2014. 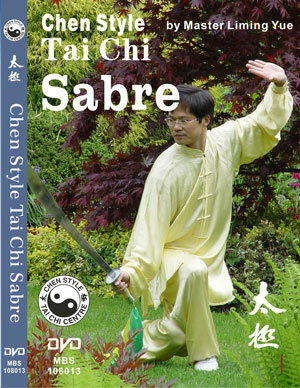 Tai Chi Sabre dvd was released on Saturday, 30th November 2013! Details: Chen Style Tai Chi Sabre Dvd was demonstrated and instructed by Grandmaster Liming Yue. This instructional DVD is suitable for both beginners and experience Tai Chi practitioners. The DVD includes an explanation and demonstration of each movement repeated from different camera perspectives and at different speeds with detailed commentary to maximise the benefits of practice. All footage was filmed in a professional studio with clear image and sound. Running time 65 mins approx. Details: There was a great successful instructor seminar in the Centre on 15/16th June 2013; Sifu Bill Dancock, Andrea Lori and Garry Seghers have achieved their 4th level instructor certificate with some others have achieved from Foundation to level 3 instructor certificate. With the new growing of instructor team we are getting much stronger to promote Chen Style Tai Chi and Chinese Health Qigong in the UK and European countries. The next instructor seminar will be in December 2013. Please book your place in advance to receive the maximum benefit of early preparation, which will enable you to achieve the highest outcome over the assessment. 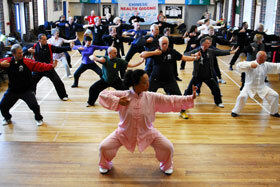 Tai Chi and Qigong Open Event in Altrincham Leisure Centre Sports Hall on 30th March 2013 finished successfully. There were a series of demonstrations including Lion Dance, Tai Chi form, weapons, Push Hands and Chinese Health Qigong exercises. Following this, there was a taster session open to everyone. The people who take part in the demonstration are from Italy, Malta, Spain, Ireland, Greece, France and U.K. We are going to publish more photos and videos footage on the web site once we sorted it out. Many thanks for those people who support this Event. 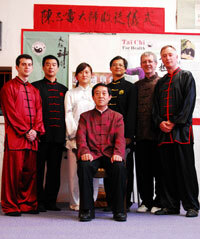 Tai Chi and Qigong Open Event - Easter 2013! We are going to host a major Tai Chi and Qigong Open Event in Altrincham Leisure Centre Sports Hall. There will be a series of demonstrations including Tai Chi form, weapons, Push Hands and Chinese Health Qigong exercises. Following this, there will be a taster session open to everyone. This will be a unique opportunity to see Tai Chi and Qigong demonstrated by world class Masters and to experience the health and wellbeing you can gain from taking part in the taster session. The admission fee for the event is £10.00 per person. Spaces are limited, so please book your place in advance to avoid missing out on being part of this special event. Tai Chi Fan DVD was released on 26th January 2013! The DVD is filmed in the Centre and demonstrated by Master Liming Yue. You can buy this new DVD from our online shop at: www.wbpay.com; This dvd was released on 26th January 2013 during our Tai Chi Fan seminar. Please feel free to place your order now. The Dvd will introduce to the Fan movements with step by step guidance with Master Liming Yue. Chen Style Tai Chi Fan was found by Master Liming Yue based on Chen Style Tai Chi Form and applications of Sabre and Sword. It is an instructional DVD and suitable for both beginners and experience Tai Chi practitioners. The DVD includes an explanation and demonstration of each movement repeated from different camera perspectives and at different speeds with detailed commentary to maximise the benefits of practice. All footage are filmed in a professional studio with clear image and sound. Please click Tai Chi Fan DVD Trailer clip to view the example of promotional video. New Collection of Tai Chi Foundation DVD was released on 8th December 2012! This is our first Collection of instructional DVD on the Chen Style Tai Chi Foundation Exercises. The DVD is filmed in the Centre and demonstrated by Master Liming Yue. You can buy this new DVD from our online shop at: www.wbpay.com; The dvd is in stock now. Please feel free to place your order. FREE DISPLAY IN THE PARK AT 2.30 PM; EVERYONE ARE WELCOME! Please book your places as soon as possible and visit the Official web site to find out more information. New Tai Chi videos on YouTube by Master Liming Yue! Master Liming Yue has uploaded a few Tai Chi video clips on YouTube since early June 2012. It covers Tai Chi 11 Form, Fan 16 form, first 15 movements of Cannon Fist, completed 83 Form, Laojia Form, Taiji Push Hands with Master Zhang Dongwu and Chen Style Taijiquan Applications with Sifu Aamir Rafi and Steven Burton, so please visit Liming's Tai Chi videos page for further details. We are going to publish more video clips online shortly, so please keep your eyes on our web site. Master Liming Yue was awarded a back dated title "No. 1 disciple of Grandmaster Kongjie Gou"
Grandmaster Kongjie Gou had hosted an Indoor students acceptance ceremony in the Centre on 2nd October 2011. There were four English students from Oxford had been accepted as indoor students on the day. The ceremony was organized by Master Liming Yue as he was awarded as No.1 disciple of Grandmaster Kongjie Gou in 1994 in China. All indoor students had received a certificate issued by Grandmaster Kongjie Gou. 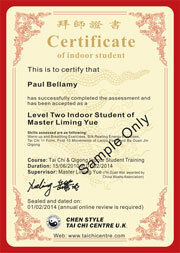 Master Liming Yue has also received a back dated certificate of No.1 disciple as well. According to traditional Chinese customs Master Liming Yue is now official Top 18 Disciples of Grandmaster Chen Zhenglei announced in 2008 and back dated No.1 Disciple of Grandmaster Kongjie Gou in 1993. We conducted a series of Chinese Health Qigong seminars in the Centre in co-operation with British Qigong Association in June 2011. It covers Yi Jin Jing and Liu Zijue. The Instructors are coming from China. 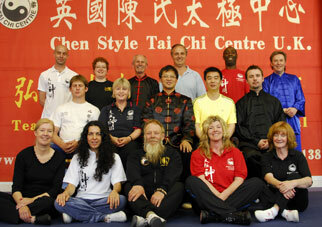 please visit our Tai Chi seminars page for further details. Qigong Seminars & Grading finished very successfully! We had conduct a series of Chinese Health Qigong seminars in the UK and Italy with Chinese Health Qigong Association in October 2010. It covers Five Animal - Wu Qin Xi, Yi Jin Jing, Ba Duan Jin. The Instructor Team from China were led by Master Cui Yongsheng who is the Master in the dvd 'Five Animal Movement' and Master Shi Aiqiao who is the Master in the dvd 'Yi Jing Jin'. 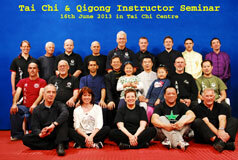 Additionally, the Qigong grading took place in the Centre on 3rd October 2010 during the seminars as well. A group of 14 people has achieved 2nd Duan Wai. (The Duan Wei certificates were arrived in the Centre on 18th Feburary 2011). Please visit our Tai Chi seminars page for further details. A group of three senior students of Master Liming Yue were accepted as indoor students by Grandmaster Chen Zhenglei on 23rd May 2010 in the Centre. They are Pete Hornby (6th Duan Wei, UK), Pluto (4th Duan Wei, Greece), John Collins (4th Duan Wei, Ireland); Master Liming Yue, Master Chen Juan (daughter of Grandmaster Chen Zhenglei) and Sifu Di Qian were also present at the acceptance ceremony as witnesses. There are seven senior students of Master Liming Yue that have been accepted as indoor students by Grandmaster Chen Zhenglei since 2004; We are still continuing to help senior students from the Centre to be accepted as indoor students by Gandmaster Chen Zhenglei in the future. Please contact Master Liming Yue for further details. 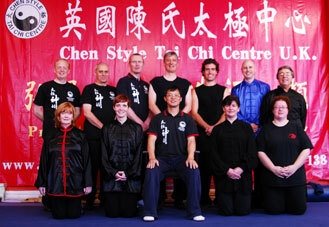 The Chinese Wushu Grading was very successful in Dublin, Ireland on 7th March 2010. There are 50 people on the event and all received their Grading certificate on the day. The highest grading received was 6th Duan Wei by Peter Hornby. The event is organized by Chen Style Tai Chi Centre, Ireland Laugar Association, Association of Chinese Kung Fu Ireland and China Wushu Association. People comes from Spain, Portugal, Italy, Poland, Damark, UK and Ireland. The examiners were Vice president He Qinglong, Professor Kang Gewu (9th Duan Wei) and Mrs Zhang Yuping (8th Duan Wei) from China Wushu Association, Grandmaster Jemery Yau from Laugar Association and Master Liming Yue (7th Duan Wei) from the Centre. Master Sam Sun (6th Duan Wei) from Dublin. For further details please contact Mater Liming Yue in the Centre directly at 0161-2737138 or visit the web page at: www.taichicentre.com/grading2010.php . Our Centre has been invited to take part in the third World Health Qigong Competition held in Shanghai, China on 14th August 2009 during the China Trip Summer 2009. There were about 400 competitioners from over 38 countries and it includes the China National Competition Team as well. Marco Fasanotti and Marie Normoyle had won the second and third classes of performance. 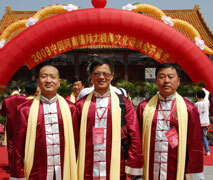 As part of the event, there was a Preparatory Meeting for the World Heath Qigong Federation on 16th August 2009. Master Liming Yue and Sifu Marco Fasanotti have been invited to join the meeting and had been selected as Committee Member of the World Health Qigong Federation! For further details please contact Mater Liming Yue in the Centre at: 0161-2737138 or visit the web site at: Health Qigong page. The Chinese Wushu Grading in Zhangjiajie Forest Park, China on 8th August 2009 has been a great success and it was organized by Chen Style Tai Chi Centre and China Wushu Association. The examiners are Dr Jian Liujun from France, Grandmaster Peng Hanchi from China Zhuzhou Wushu Association, Master Wang Lifeng from China Wushu Association and Master Liming Yue from the Centre. Nick Taylor, Pete Hornby and Qiang Di from the Centre had received their 5th Duan Wei and others had also received their own grading as well. For further details please contact Mater Liming Yue in the Centre directly at 0161-2737138 or visit the web page at: www.taichicentre.com/grading2009.php . Master Liming Yue was awarded as International Ambassador of Taijiquan Culture Promotion in Tai Chi village, Wen county, Henan province, China on 30th August 2009, by China Friendship Association (governing body) and Foreign Department of Henan Province, China. Grandmaster Zhu Tiancai, Grandmaster Wang Xian, Master Zhang Dongwu and Master Xia Ping also received the title of International Ambassador of Taijiquan Culture Promotion as well. Master Liming Yue is the only official representative selected from the European countries on the event. Please click here for further details. Silk Reeling Energy DVD has been released and it becomes the most popular one! the online shop . The video footage was filmed in a professional studio in China with the latest DVD authoring techniques enabling you to navigate and watch the DVD easily and efficiently. The commentary for the introduction is covered by Chinese, English, Spanish, Portuguese and Greek. The commentary for teaching is in English and with subtitle on as well. Congratulation to the new Instructors! On completion of the Tai Chi Instructor training course there were 15 people have successfully passed the assessment and received their instructor certificate from the Centre today. As part of our training programme we are going to help experienced students move on to the instructor team to promote the authentic Chen Style Tai Chi worldwide. Please visit our instructor training programme page at: http://www.taichicentre.com/instructor_training.php to find out more about the details. Welcome to join our group and wish all instructors enjoy the journey of teaching and promotting the Chen Style Tai Chi to benefit many people in the world. A series of Chinese Wushu Duan Wei grading training seminar was taking place at the weekend of the 22nd/23rd November 2008 in Porto, Portugal and 29th/30th November 2008 in Madrid, Spain. Which was running in co-operation with China Wushu Association by our Centre. The examiners are Master Chen Shihong from Austria, Dr Jian Liujun from France, Grandmaster Yau Kam Wah (Jeremy Yau) from Laugar Association, and Master Liming Yue who is also appointed as a representative for the event by China Wushu Association. Everybody who taken part in the event has been given a provisional grade by the examinars and the official Chinese Wushu grading from China Wushu Association to be verified on 23rd December 2009 in Beijing! Please keep your eyes on this news section for the final result of your grading. Participants come from UK, USA, Portugal, Italy, Ireland, China and Japanâ€¦etc. For further details please visit the web site at: grading page . A TV shoot with the Centre for a Tai Chi feature on the show Zeitgeist was filmed by the producer, Paul Barron in April 2007. The Tai Chi feature was broadcasted on Sunday, 28th October â€“ 9:40pm by Manchester Channel M. It covers Qigong, Tai Chi Form, Weapon, Push Hands and Application for Health and Martial Arts. The Dvd copy is available for those people who took part in the program. Please ask for Master Liming Yue for your free copy. Alternatively, you can visit the web site to watch the whole programme at: www.zeitgeist-online.com/media/zeitgeist6_part2.htm . Tai Chi 18 Form DVD is released today! the online shop . Grandmaster Chen Zhenglei is the foremost authority on Chen Style Tai Chi and the creator of the 18 Short Form. This form has been designed for beginners of Chen Style Tai Chi, and is part of the book Tai Chi for Health. The DVD includes an introduction, followed by a demonstration of the 18 Short Form with step by step instructions for each individual movement as well as explanations and breakdowns repeated from different camera perspectives and at different speeds with detailed commentary to maximize the benefits of practice and implementation. The video footage was filmed in a professional studio in China with the latest DVD authoring techniques enabling you to navigate and watch the DVD easily and efficiently. The commentary for the introduction is covered by Chinese, English, Spanish and Greek. Tai Chi for Health - released! Steve Burton, Ploutarchos Vlachopoulos and Neil Grimley from our Centre have just returned from China with two gold and three silver medals. 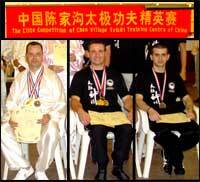 The three took part in ‘The Elite Competition of the Chen Village Tai Chi Training Centre of China’ as part of the China Trip 2004. Steve Burton took gold in the under 35’s Tai Chi forms and silver in the Tai Chi Sword, and Ploutarchos Vlachopoulos took silver in the form. Neil Grimley took gold in the over 35’s form and silver in the sword. 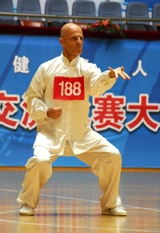 The government sponsored competition is held each year in the birthplace of Tai Chi and attracts more than 300 of the top competitors from all over China. This year’s competition was the subject of a documentary by Central Chinese Television and so the students received their medals from Grandmaster Chen Zheng Lei in front of millions of Chinese viewers. As a final feather in the cap of our Centre, we took the award for the ‘Best Attending Organization’. New Laojia Form DVD Released! Master Liming Yue is very proud to be the cover story of the March issue of Martial Arts Illustrated magazine. Martial Arts Illustrated is Britain's number one martial arts magazine, and this months issue contains an excellent interview by Master Shabir Akhtar who talks with Master Yue about Chen Tai Chi's true origins and meaning, and the differences in training practice and understanding between China and the West. You can visit Martial Arts Illustrated website by clicking here, find out more about Master Shabir Akhtar by visiting his website here, and Martial Arts Illustrated magazine is available in all good newsagents. Today, as part of the main event in his visit to the UK, Grandmaster Chen ZhengLei accepted an Honorary Life Presidency of the Chen Style Tai Chi Centre. This significant symbolic gesture further strengthens the ties between our centre and Chen Jia Gou, the birth place and spiritual home of all Tai Chi. Grandmaster Chen is the heir and head of the 19th generation of the Chen family in China and the inheritor of the Chen family Tai Chi. His acceptance is a great honour for The Centre and all of our students.